So you've just typed 'The End' on the final page of your story? Very well done! Now, how do you turn a manuscript into a shiny, eye-catching book and get it out there under the noses of as many readers as possible? After typing 'The End', park your first draft. Forget about it and do something else for at least a week – ideally longer. With a clear head, return to your script and read it in Word (or your preferred writing app). Fix obvious typos, clumsy sentences and so on as you go, but capture any bigger issues you find (anything that will take more than half an hour to fix) in a list and move on. Once you've read it through, jot down how the book felt to you. Can you describe each quarter of the story in one punchy and enticing sentence? Did all the arcs and secrets conclude nicely or tee-up a potential sequel? Work through that list of bigger issues you created earlier. This can feel like open-heart surgery, but be brave (and always make a copy of your script before tackling each item on the list). Now? Read the script again. Rinse and repeat the above four steps until you gain good level of confidence that your story is rock-solid. After that, prepare a large pot of coffee, prop your eyelids with matchsticks, and take a deep breath. It's time to use text-to-speech! Most word processing apps have a Text-to-speech (T2S) feature. In Word, I just press play and let the robo-voice narrate the story back to me, while I eye-scan the words on the page at the same time. This gives double confirmation that what I think I am reading actually tallies with what I hear. You'll be astounded at the number of sneaky typos and even plot contradictions this weeds out. Not the most fun activity, but a worthy slog. After this, you should have the confidence to let a trusted reader cast their eyes upon your work. By this I mean one reader who knows you well enough to be brutally honest with you - to point out any major clangers/weak plotting or similar. Once they've read your story, conduct a short interview with them. Phrase any uncertainties you have about certain aspects of the story as open and non-leading questions, e.g. : if you’re concerned that the main character had too-sudden a change of heart, ask your trusted reader: "How did you feel about the main character's change of heart?”, then consider their answers and tweak your manuscript to suit if needed. Next, it's time to widen the audience, slightly. Establish a small group of 2-4 readers who are up for beta-reading. The point here is to tease out any remaining wrinkles and - hopefully - get a clean round of thumbs-up from these guys and further bolster your confidence that the story is a gem. And at that point, you have successfully self-edited your script. Congratulations! Now comes the fun bit: drawing maps, diagrams, creating cast lists, glossaries, author's notes, dedications and more. The main thing here is to keep it concise and useful - make sure each and every page before and after your story has a purpose and is of value to the reader. I once made the mistake of having dozens of pages of historical info before my story began, which didn’t go down well with some readers – a lesson well learned (now I include a simple link to a book ‘gallery page’ on my website, where the more in-depth historical discussion can be detailed in full). In particular, an 'Also by this author' page in the front matter is something of benefit to both you and the reader. Add a list of all your other works, and format them as links in the eBook editions to help increase the chances of more sales. And for back-matter, the prologue of book 2 makes ideal parting message for the end of book 1 – especially if is ends on a cliff-hanger and signs off with a link to book 2's product page! Yeah, you know the old saying. Well, it’s nonsense. People are drawn to striking imagery, and the book cover is your one chance to express the many thousands of words in your tale in a heartbeat. The cover is effectively your brand: the thumbnail on web stores and the spine in a bookshop shelf are your main routes to sales. I use my latest cover, or a slice of it, as my Twitter and Facebook background, I even have them printed on bookmarks, postcards and business cards and keep a stash in every coat pocket and in my car to pass on to interested folk I meet when out and about. So how to make that cover as striking and enticing as possible? 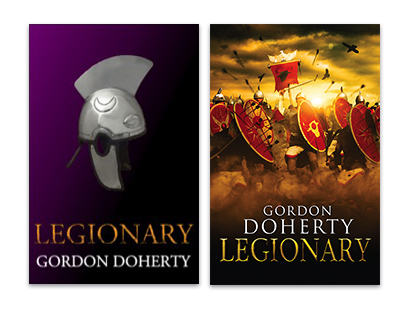 I initially designed my own cover for Legionary, and was happy enough with it, given my limited graphic design skills. But a few readers commented that the cover did not do the story justice. So, I set out to find a professional design company to do me a better one. MoreVisual were quick off the mark, drafting a prototype image which blew me away. I commissioned a full version and I've never looked back. 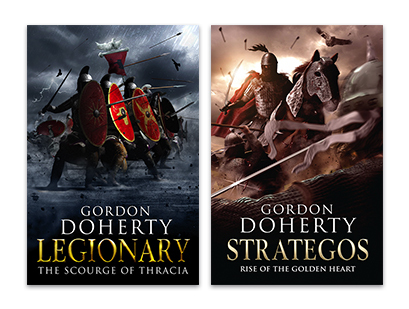 Best of all, sales of Legionary tripled almost overnight! I did try another company for a recent cover, and while found that their first draft was okay, the subsequent drafts drifted further and further away from what I wanted. With MoreVisual (and I'm not on a commission for saying this) it is the opposite: a good first draft that very rapidly becomes a spot-on final cover. From this… to this. Is it a surprise that sales nearly tripled with the change of cover? More of my covers designed by More Visual. Perfect adverts for my books. Think how your cover will look in thumbnail size. As mentioned, it's vital that it is still eye-catching at this much-reduced size. Stay reasonably true to the genre. Be creative, certainly, but a romance novel with some burning zombies on the front will probably not attract the intended audience… and disappoint the zombie-fanatics who do purchase it! Don't overdo the detail: your story is about a boy who lives in a castle with three ogres and a witch, and he has a magic hat and two herds of buffalo. Don't try to cram all these things onto the cover. Pick the main aspect or aspects, and make them look amazing. Don’t get too hung up on the back cover (relevant only to the print edition). The front cover is the premium real estate and the spine comes second. Few people fondly recall back covers. The Kindle Unlimited scheme (KU), which offers a subset of the eBooks listed on Amazon to readers who pay a monthly subscription fee. The reader gets to 'borrow' books and keep them as long as they are paid-up KU members. The author, who has to opt-in to having their book in the KU library, receives a small payment which is calculated 'per page read' by the reader ($0.00419 per page in Aug 2017). A slow but steady trickle of income as opposed to the direct sale route. For a simple life, you might want to do both of the above. But, there is a catch with KU: opting in to it precludes you from selling your eBook anywhere else online. There are many debates about the pros and cons of this 'exclusivity' requirement, but I have found during a few experiments with KU that it yields a similar income to that accrued from non-Amazon eBook sites. Of course, there is the further argument that you lose a certain amount of exposure by 'only' being on Amazon. Further to the above, here is a neat 'KDP Jumpstart' article to guide you through the Amazon self-publishing process. Amazon's main competitor. Smashwords is a clever thing. Upload your chrysalis of a word doc once, and watch it burst free as an eBook and flutter off to iBooks, Barnes and Noble, Kobo, Baker & Taylor and dozens more eBook-outlets. Readers purchase from those outlets and Smashwords send you your cut of the royalties once a month (same as Amazon). You can even generate coupons to allow readers to claim free or discounted copies of your books – a neat promotional tactic. The downside to Smashwords is that it is a little trickier to get your word doc accepted by their ominously-named 'MeatGrinder' processor, and usually once it gets the thumbs-up, you have to accept some odd/untidy formatting or grainy images, but this is understandable given that they are trying to output an eBook to satisfy so many end retail outlets. My experience has been good with Smashwords. They are very helpful and, while sales through this channel don't really stand up to those through KDP, you do have that warm, fuzzy assurance that your work is in the shop window of just about every major eBook retailer. The choice here is simple: KU (and Amazon exclusivity) or Smashwords? With Createspace, you shape your script in a word processor, save it as a PDF, upload it and your cover, then order a proof copy. It's slick, free, and closely intergrated with Amazon's KDP system (so you can even publish a paperback with Createspace and generate an eBook edition automatically). Amazon will order copies of your book from Createspace – who will print them on demand – to meet sales on their websites, and you will receive a monthly royalty payment. Even slicker, just as free and 100% integrated with KDP! The process here is 'upload one Word doc and we'll generate an eBook and a treebook from it'. I haven't used this system, but I have heard there are teething issues with in - and I'm more comfortable with the precise, PDF-driven control over formatting etc that Createspace allows. I have also heard that Createspace is marginally more profitable in terms of royalty rates. Whichever combination of outlets you opt for, each will, unfortunately, require your script to be in quite different formats. Certainly, the Word template for a Createspace paperback, the Smashwords Style Guide and the KDP Formatting Guide have very little in common. You could attempt to find a common denominator that fits all three, but in truth I'm not sure that is possible or even worth the effort. I tend to write my book manuscript in Word, styled to make a good Amazon eBook, taking it as far as I can, so it is drafted, edited, proof-read and polished. Then – look away if you suffer from OCD – I'll duplicate the script, pasting the content into the relevant Smashwords and Createspace templates and tweaking to suit. Of course, the downside to this is it means any future edits will require you to replicate the changes in three places, but I've not found this too painful so far, and I've released various glitch/typo fixes over the years. How much should you charge for your many months of hard work? Amazon's royalty system might seem a little odd at first: 35% for books under £1.99 and over £9.99, and 70% for anything in between. Really it's Amazon's way of corralling books into a sensible 'goldilocks' price range, I.e. not too cheap and not too expensive. Some authors price their work at 99p and even 49p to try to hoover up as many sales as possible. I'd advise against this: products at rock-bottom prices can suffer from a perceived lack of value. That said, people still like a bargain. Thus, £1.99 – the start of the 70% royalty range – is a solid starting point. If you release books in a series over time, you can look at 'loss-leading', i.e. dropping the price of the first book to the aforementioned 99p, while keeping the rest at a higher price point, or increasing the price of the later books in the series, e.g. £1.99 for the first book in the series, £3.99 for the rest. Overall, the rule of thumb is: play with the price point and see what works for you and your target audience. There is less room to manoeuvre with physical books. Essentially, the print production process costs as much as it costs and there is nothing you can do about that. Your goal here is to find a sensible price point just above the production costs that gives you a little reward. Typically, a 300 page book published via Createspace will cost roughly £8 to produce. Normally, I'd then price this book at £8.99, giving me £1 per sale – hardly a king's ransom but a nice round figure that also keeps the price low enough to attract readers. This is governed by the ACX/Audible website, so you don’t have to worry about this. Your bio – short and sweet. A good mugshot – adds a bit more of a connection than just text. A contact form – essential to help you build up a contact list. A showcase of your books – again, your covers should be the main eye candy here. A blog – a great way to stay current, to explore topics related to your books and to allow discussion and commenting. Whenever something happens that is worth shouting about (i.e. a new release or a review in a national paper), send out an e-newsletter to your contact list. Decorate it with striking artwork relevant to your books, and throw in a Smashwords or paperback giveaway comp while you’re at it. Try not to bombard your reader list with these though – once a month is plenty. Use social media: Twitter, Facebook et al are fantastic ways to get the word out there. But beware of overdoing it: there's nothing more offputting than a serial 'buy my book' poster. By all means shout loud and far about an imminent or new publication, but in the main, try to engage readers out there by making a post worth looking at or asking their opinion on dilemnas you have (alternative plot choices or cover ideas) – this is far more enjoyable and useful for you and the people on the other end of your posts. Whenever you create a link to your books on Amazon – on a tweet, Facebook, in an email newsletter or on your in-script 'Also by this author' page, it is a good idea to use www.booklinker.net, a site which will automatically direct anyone who clicks through on the link to the best regional Amazon site for their location. This greatly increases the chances of an interested party swiftly getting to the 'buy now' button on your book's product page. Even better, you can set up booklinker to use your Amazon Affiliates ID, meaning you earn an additional 5% (roughly) on every sale. Handy pocket money! Paid-for marketing: I've tried paid-for Facebook Ads, Tweet engines, radio ads and magazine ads. Put simply, they did little for me. Never once did I notice a spike in sales or interest despite my investment. There are many ways to advertise for free though: as well as the means mentioned above, you can also check the press. See if any local or national papers have a slot for up and coming or independent writers and try sending them a little piece – jazzed-up with your foxy cover, intriguing strapline and a link to your shiny website, of course. I did this, submitting Legionary to a popular daily Scottish newspaper's 'New Writer' section. It was a roaring success, with a huge spike in sales for a good few days. Enjoy yourself. It's such hard work writing a book that you have to savour the process of publication and seeing your efforts rise and prosper. Good luck!